Hey, there might actually be somebody crazy enough to want to own an NFL team in London! 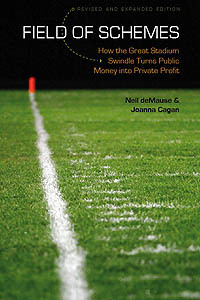 According to NBA columnist Mitch Lawrence writing on the Forbes website, “industry sources” say that Josh Harris and David Blitzer, owners of the Philadelphia 76ers, are “gunning to own the first NFL team in London.” In fact, their recent purchase of minority shares of the Premier League’s Crystal Palace, according to Lawrence, is an attempt to “get to know the market” in advance of a London NFL push. Lawrence is a former New York Daily News basketball columnist now writing for Forbes as a “contributor” (i.e., freelance, possibly not paid); the number of named sources in his story is zero, which is always a bit of a red flag, and Lawrence’s previous record with unnamed sources includes plenty of misses. Presumably somebody chose to leak this through him, likely Harris and Blitzer themselves, which would make sense if they want to position themselves as the top candidates to get a London expansion franchise if one becomes available for the right price … but now we’re deep into multiple levels of speculation. File this one away, anyway, and if it comes up again, preferably from someone with an actual name, we can start to take it more seriously. 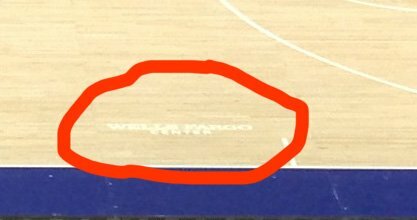 That is “Wells Fargo Center” written as small as possible, in white lettering against a light-wood floor, so that no one will ever be able to read it or even notice it without a big red oval drawn around it by the Philly Voice’s art department. Apparently the only reason it’s on the court at all is to meet the letter of some league rule — I bet there’s going to be some fun times debating font sizes at the next meeting of the NBA’s Court Branding Subcommittee. Sixers stop using arena’s corporate name, does this mean we can too? The Sixers have decided to stop referring to the Wells Fargo Center by name in all news releases and on the team website because the financial institution chose not to become a business partner with the basketball franchise. Chris Heck, chief revenue officer of the 76ers, said the team values its partners and tries to maximize its relationships. “We also continue to enjoy our relationship with Comcast Spectacor as tenants at a world-class arena, but that particular bank is currently not a sponsor of the Philadelphia 76ers,” Heck said. So a bit of background: Comcast Spectacor is not only a giant cable and arena management company, but also owner of the Flyers, who own Philadelphia’s arena. Wells Fargo is the bank that bought Wachovia, which in turn bought First Union Bank, which bought CoreStates Bank, which agreed to pay $2 million a year through the year 2024 to slap its name, or that of its successors, on the building. Since the 76ers aren’t getting any of that money, and are free to sign up their own “official bank of the 76ers” that may not be Wells Fargo, why should they agree to use the name? It’s a reminder of the ephemeral nature of corporate naming rights, in which tens or even hundreds of millions change hands for something that depends on regular people agreeing to actually go along with the paid nomenclature. Ever since the Denver Post caved in on trying to call the Broncos‘ new stadium “Mile High Field” rather than whatever its naming-rights sponsor wanted, the supremacy of paid names has been mostly unquestioned. However, the 76ers’ move — which is unlikely to be widely replicated, since most teams are the ones getting the naming-rights fees, but anyway — is a reminder that while you can put a big sign on a building, you can’t force people to say the words. Already, Deadspin has announced its intentions to follow suit — “the next time you read us writing about something occurring at Tropicana Field, feel free to (politely) drop into the comments and remind us that we aren’t getting free juice boxes, and that it’s actually the Florida Suncoast Dome” — and you have to wonder if other corporate-sponsorship-hungry media outlets will eventually follow suit. Though come to think of it, a world where every website uses its own name for things based on who paid them for it is even scarier than the one we already have. It all just makes me want to crawl back into Sleepy’s Mattress bed. The state would cough up $82 million over 10 years in “tax credits,” which in this case appears to be less actual kickbacks of actual taxes than just “the public cuts you a bunch of $8.2 million checks.” That’s a present value of about $63 million. In exchange the state would gain 250 jobs that would shift across the river from Philadelphia, though no doubt many if not all would be part-time, given that basketball teams don’t practice 365 days a year. That’s a cost-per-job ratio of $252,000, which even in the world of corporate relocation subsidies is exceptionally craptacular. And it’s even worse than that, because with those part-time jobs just shifting across the Delaware River, it’s inevitable that the vast majority of workers will continue to be the same people who the 76ers employ now, living in the same states they do presently. So New Jersey would get a small bump in income tax receipts pro-rated to the handful of days per year they were in Camden, and sales taxes from anyone going out to buy lunch, and … that’s about it. On the bright side, it’s not like the Sixers’ billionaire owner Josh Harris is getting singled out for this lavish treatment: New Jersey has already doled out $4 billion in corporate subsidies since Chris Christie became governor in 2010. Wait, that’s not a bright side. Unless you’re one of the 252 business owners who’s divvied up that swag, in which case these are very bright times indeed. The cost of the facility is still undetermined, according to the league source, who also didn’t divulge the amount in tax credits the Sixers will receive. However, another source believes it’s a dollar-for-dollar deal – meaning if the team spent $50 million on a facility, it would be entitled to $50 million in tax credits. The Philadelphia Inquirer says that this would be “a major coup” for Camden, because … the city would be getting to host the Sixers’ practices but the state would be footing the entire bill, I guess? Not that there’s really any economic benefit to hosting Sixers practices unless whoever they trade Michael Carter-Williams for ends up making a lot of runs to the local supermarket for snacks, but sure, yay on Camden for getting something worthless for free! Though not as much as Sixers owner Josh Harris, who is clearly using his new New Jersey connections to lucrative effect.